The last week has been a lovely change in pace, with more time to appreciate every moment and take the time to do the things I enjoy. There has been a lot of new recipes happening in my house this week, as well as updating my portfolio site, holiday planning (Oh yeah, Matt and I are heading off to Kakadu National Park in the Northern Territory of Australia in a little bit to explore, hike, camp and connect with the oldest living culture on earth and NOT be eaten by a crocodile like my dad keeps warning me!) and even a trip to the Melbourne Zoo. With a little more time up my sleeve at the moment, I have really been able to think about what projects I want to start and what I want to share with you all. Last week I really witnessed for the first time, the nasty side of the internet where people hide like phantoms and feel entitled to tell you what you should and shouldn’t do on your own personal blog. I am really lucky to have a great group of inspired followers and readers who gain so much from being on this journey with me, and I know that all I need to do is stay true to who I am and what I create, and not only will I be fulfilled but I will keep providing inspiration in this space, and for me that is what it is all about. So the answer is simple to me. There is no where else to go, but to make my favourite food and shoot it. In case you haven’t heard – I absolutely adore Asian cuisine and boy am I living in the right city for Asian fusion explosion. Here in Melbourne we are surrounded by amazing chefs testing the limits of Asian flavours and favourites. For me, this is my happy place and so I’m going to shoot and share some Asian delights on the blog over the coming weeks. This idea has also allowed me to seek out the great Asian Grocers near me, and gosh did I find heaven. The things you can buy there. This is going to be so much fun! Next up, I think will be dumplings. I have already enrolled Matt into a dumpling making Saturday, that’s tomorrow. Eating all day – now that’s my kinda day! Preheat oven to 180 C (375 F). In a bowl combine the flour, chinese five spice, sichuan pepper and salt. Stir until fully combined. Coat each chicken piece in the flour mixture and lay on a shallow baking tray. Place in the oven and bake for 55 minutes. Coat each chicken piece with a small amount of oil throughout the cooking process at 20 minutes and 40 minutes. After 55 minutes, increase the oven temperature to 240 C (465 F) and cook for a further 10 minutes to let the chicken brown and skin to crisp up. Turn off your oven. 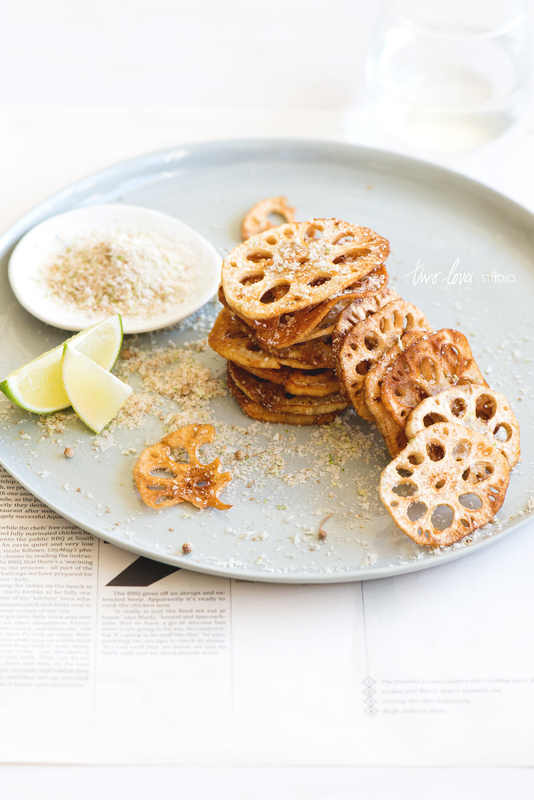 While the chicken is cooking, you can make your lotus root chips. In a bowl, combine the salt flakes, lime zest and ground coriander. Set aside. After the 55 minute mark of the chicken’s cooking time – heat your oil over a medium-high heat. Once the oil is hot, carefully place a handful (you might want to do more or less dependant on your pan size) of lotus root into the oil and allow to fry for a few minutes until they turn golden brown. Remove from the pan with a slotted spoon and allow to rest on some paper towel to remove the excess oil. Whilst still hot, sprinkle over your salt mixture (remember less is more). Keep frying and salting your chips in batches until done. (Leave the hot oil to cool before you attempt to dispose. Be careful during the cooking process as hot oil will cause nasty burns if spilt or it splatters during cooking. Keep water away from the oil as this makes it spit). 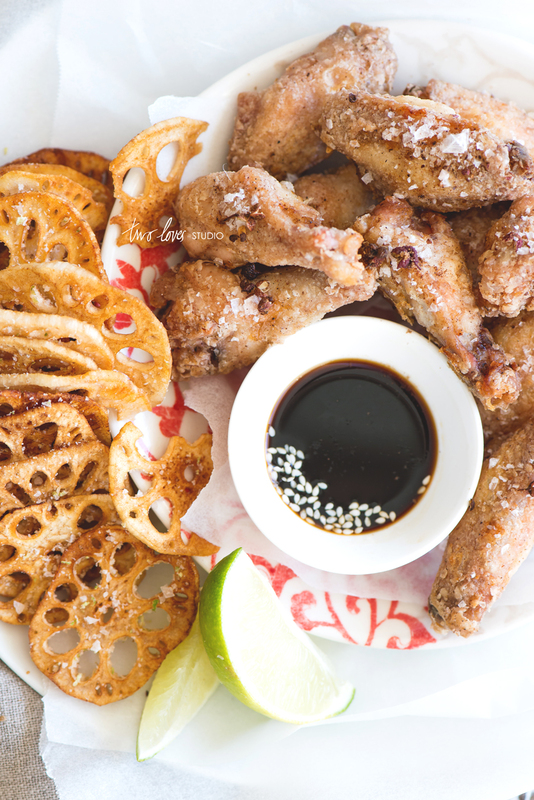 Remove the chicken from the oven, service with soy sauce for dipping and your lotus chips. You can even squeeze a lime over the chips or serve them on the side if you have one left over from the zest. *Lotus Root – you can find lotus root at your local Asian Grocer. Fresh lotus root can be quite pricey, and if it is or out of season you should be able to pick up frozen, pre sliced lotus root from the Asian Grocer instead. If the slices are too thick, carefully halve them longways with a steady hand and sharp knife. Australia sounds like a lovely place, we love to hike, we are here in the southwestern part of the us. Lotus root has always intrigued me. Beautiful pictures! Thanks Cheri, it certainly is a lovely place – much like the USA, very diverse. They have also intrigued me also for quite some time, so I bit the bullet and went and made some! Really! I can understand why dried would taste like that. It has a little bit of a gluey consistency to it. Fried is much nicer, almost like potato – but way cooler. Melbourne is an amazing place, what do you miss the most about it? I know if we were to move, I would crave for the food scene. This is probably the best comment I have had on my space here thus far, so nice to know your mum will be excited for this post. I hope I do the Asian cuisine justice. I am really looking forward to it. That is quite alright, I think it happens to everyone – it’s just a good reminder to always been true to yourself! Rach – this looks and sounds so good that Im out tomorrow to locate some lotus root and cook this recipe during the week. I will let you know what I think of it. Great – can’t wait to hear what your thoughts are! We love five spice around here, and my son LOVES (like, with the passion of a thousand burning suns!) chicken wings. This looks like a must do for our family. Not sure I can manage the lotus chips here in coastal Virginia in the US, but we’ll manage. And I’m sorry that the screaming meanies came out. I love your work, and you’ve long been an inspiration to me. Kids love chicken wings don’t they – Matt is still a kid in that respect. 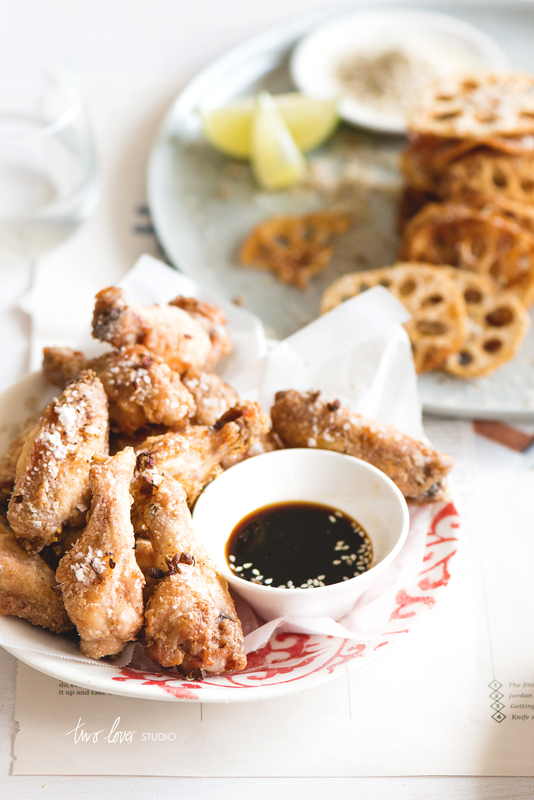 Aussies don’t make a big deal about wings like the USA does, which is a real shame as they are such a great dish for brining people together. Thanks for your kind words Lauren, it means a lot! I think that you are doing a great job and have a lovely blog. Such a shame that people want to destroy that and leave inappropriate comments. Keep up the good work and have a great trip. Thanks Tracey, I think people forget that behind these blogs are real people doing what they love! I am really looking forward to my trip and eating out of cans for a week, (maybe not?). 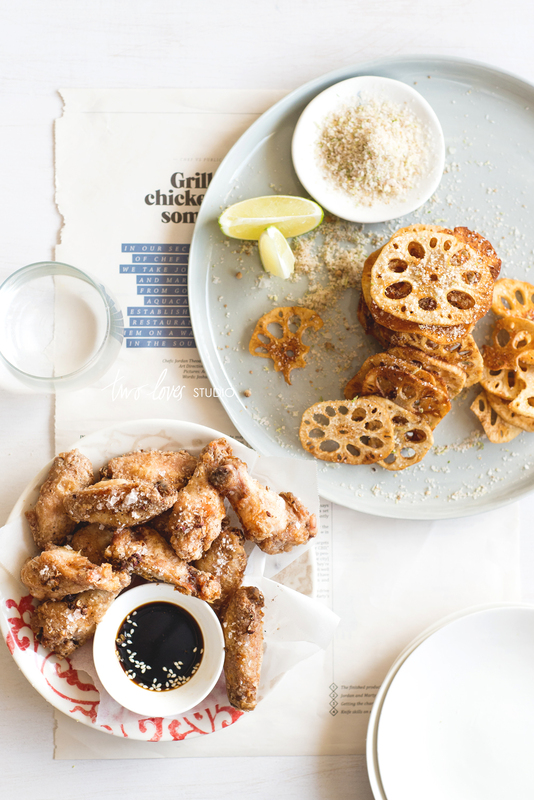 These look awesome -and- Im wayyyyy jealous of your asian food scene in Melbourne. yum! Oh, I’ll bet. It is one of the reasons keeping me in this city. I would eat it every night of the week if I could!